Wrexham have completed the free signing of Gavin Ward from Chester City on an 18-month contract. Chester agreed to release the 37-year-old goalkeeper, who has played just once this season, from the two-year deal he signed last summer. 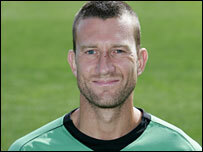 Ward famously scored an 80-yard free-kick for Tranmere in September 2006 and has made over 400 appearances in a nomadic club career. He is Wrexham's first signing in the January transfer window. "I'm glad that things got sorted out so quickly and now I'm looking forward to helping the club retain its Football League place," Ward told the Wrexham website.